This post is sponsored by my wonderful client, Sabra. I hope you enjoy the bologna and cheese sandwich. 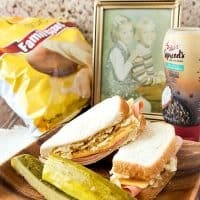 It was my brother’s favorite sandwich when we were kids. As a Sabra Tastemaker, I am fortunate to have the opportunity to try new products and tell you about them. Today is such a day. Sabra has launched a line of hummus-based sandwich spreads which are marketed as an alternative to mayonnaise. And they’re a great alternative, too. Not only do they contain 75% less fat than mayonnaise, they’re also packed full of flavor. In my opinion, they definitely bring more to the sandwich game than plain old mayonnaise. When you go to buy Sabra Spreads, you’ll find them in the refrigerated deli department. I kinda dig that they are a refrigerated product with a definite shelf life. Mayonnaise can sit on a shelf for a really long time, but these spreads are fresh and bring freshness to your sandwiches too. Other keen things about them? They’re all vegan and gluten-free, kosher and with zero cholesterol. I think you will enjoy experimenting with flavor combinations as much as the other Tastemakers and I have been doing. One thing I want you to be aware of: the containers are a bit hard to squeeze, especially when they aren’t completely full, so if you have arthritis or you want your younger kids to make their own sandwiches, it might be easier for you (or them) to unscrew the cap and apply the spread with a knife. Otherwise, and certainly in the flavor and nutrition arena, these spreads are completely welcome in my kitchen and on my sandwiches. Read more about Sabra Spreads here. In some ways, it feels like forever that my brother has been gone. And then I’ll hear a song, or smell a scent or see something he’d have loved, and it feels like just yesterday we were hanging out and watching movies together. Of the two of us, Greg was by far the more adventurous eater. As a kid he was always first to try–and like–exotic fare such as mustard. And carrots. My favorite foods were beige: pot roast, mashed potatoes, rolls, gravy. Greg really did eat the rainbow, and he relished every bite. He was a wonderful cook long before I ever decided I’d better learn to cook something other than cheesy rice in a pot. In a way, maybe my meandering into a career in food was an unconscious way to still feel close to him after he died. 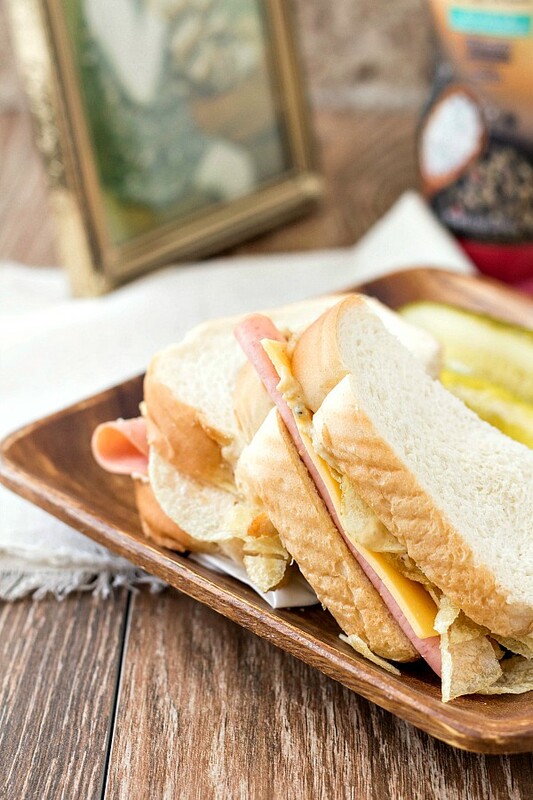 This simple bologna and cheese sandwich is really so much more than just a sandwich. It’s a connection to my brother, to childhood, and to a time when food was maybe a bit less pretentious than it sometimes is these days. Looking back, I realize I fancied this a special sandwich, because we usually made it with two–not one, but two!–condiments: both mayonnaise and mustard. My “regular” sandwich rotated: peanut butter and jelly, cream cheese and jelly or peanut butter and honey. All made on white bread, please. Soft, squishy, kid bread. 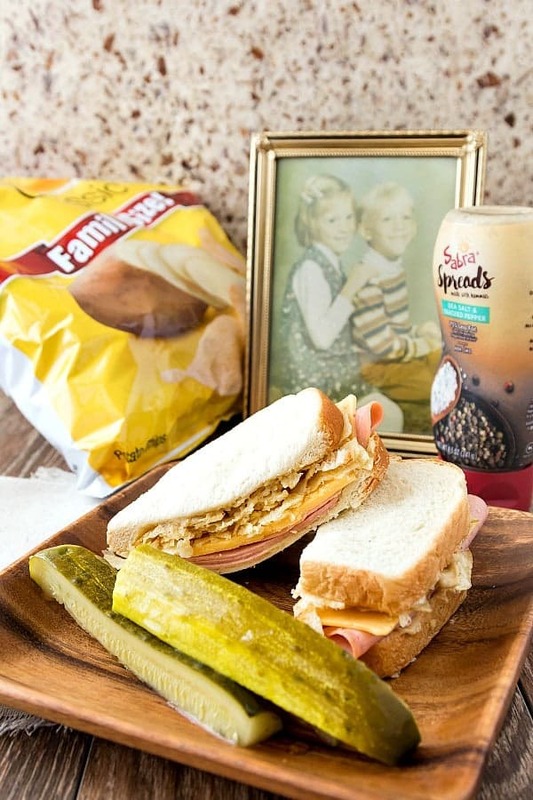 Another characteristic of the bologna and cheese sandwich that made it fancy was the sophisticated play of textures between the soft bread, the creamy condiments and the smooth bologna and cheese against the crisp, salty crunch of potato chips. Yes, lettuce or some crisp pickles would have provided another type of contrast, but, chips! Even today when I make a “boney-cheese-mayonnaise-bread-and-chips” sandwich, which was how Greg used to ask for it for lunch, as I press the sandwich down to smoosh the chips, I am snapped back to childhood. It’s the sound of the crunch and the feel of the sharp edges of chips poking up through the bread. The way the chips around the perimeter of the sandwich tend to spill out onto the plate. 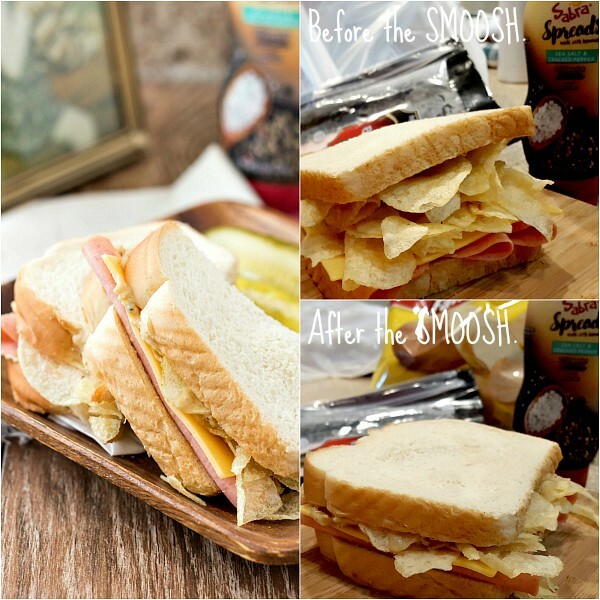 The way most of the chips miraculously stay inside the sandwich, even though just a moment before it was a teetering pile of chips with a piece of bread perched uneasily atop, not sure if it would be able to contain the mountain of fried goodness. And I have to tell you guys, I mean I know it’s a sponsored post, but the Sea Salt and Cracked Black Pepper Spread from Sabra is pretty perfect on this sandwich, bringing it out of nostalgia land and into the now. I won’t even tell if you decide to make it on fancy whole grain bread. Just please, don’t leave off the chips! This bologna and cheese sandwich is my comfort food. Add the Sabra Spread and an enormous handful of crispy potato chips, and you're in kid sandwich heaven. Spread each slice of bread with 1 Tablespoon of the Sabra Spread. Place 3 slices of bologna on one half of the bread and top with 2 slices of American cheese. You can also put one slice of cheese down first followed by the bologna and the other slice of cheese. Top the cheese with an enormous handful of crispy potato chips. Put the second piece of bread, spread side down, on top of the pile of potato chips. With your hand, firmly press the whole sandwich down to crush the chips. And there you have it. 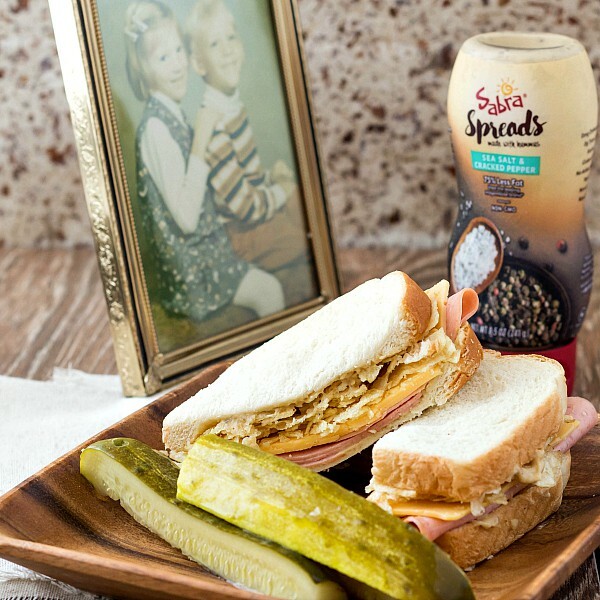 A simple bologna and cheese sandwich that is elevated not only by the new Sabra Spreads but also by the memories it brings back. I hope you make one of these, and when you do, please pile the chips high and give a good, solid SMOOSH. Enjoy. Thank you so much for spending some time with me today. Take care, and have a lovely day. It’s definitely soul food for me, David. Enjoy! 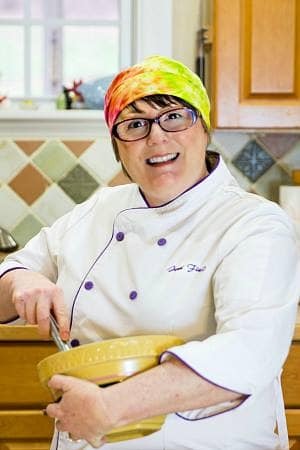 I do believe that Greg is smiling down knowing how far your taste buds have come and is so proud of the fact that you not only eat the rainbow, but you have conquered it! This sandwich looks amazing and I love the Sabra inclusion.